Fairfield at St. James is a 55+ community on Long Island in New York. This well-established neighborhood was constructed between 1972 and 1989 and is now home to 653 homes. With a variety of homes to choose from, amenities to keep residents active, and an enviable location, Fairfield at St. James has everything to make homeowners happy. At the center of the community is the well-equipped clubhouse where residents socialize and stay in shape. Fairfield at St. James offers a fitness center and an indoor pool where you can get in a few laps no matter what the weather is like. The clubhouse also features meeting rooms, a library, and billiards, providing several ways to enjoy the company of friends and neighbors. Outdoors, Fairfield at St. James has two pools and a lovely patio. There are also two tennis courts for some friendly competition among neighbors. A Scenic pond and gazebo make Fairfield at St. James a picturesque community to call home. Residents are also provided with a bus service to surrounding areas, making shopping or exploring around very convenient. Fairfield at St. James is mostly comprised of condominium units that range in size from 1,100 to 1,600 square feet and generally offer one or two bedrooms, one to two bathrooms, and a one-car garage or driveway. Most homes offer a private balcony or patio. Fairfield at St. James has a select number of townhomes. These homes offer three bedrooms and two-and-a-half bathrooms, and an attached one-car garage or a driveway. Residents at Fairfield at St. James live in a friendly community where neighbors become quick friends and enjoy participating in a wide range of activities. Billiards, tennis, and swimming are some of the activities that bring everyone together to enjoy common interests and other recreational options. Residents can also catch up on the latest news at the monthly meetings, make a difference by attending a fundraiser, or learn something new by attending a talk given by guest speakers. With the Twin Ponds Senior Club and the Tender Years Group, residents at Fairfield at St. James will never lack ways to fill their schedule. Fairfield at St. James is located in Smithtown on Long Island, New York. There is a Lowe's, Trader Joe's, Whole Foods Market, and an AMC Loews movie theater less than a half mile from the community's gates along Nesconset Highway. Interstate 495 is less than ten miles away while Long Island MacArthur Airport is just a half hour away. Fairfield at St. James is also well positioned for residents to access all the area has to offer. Veterans Memorial Park is just a mile away while Blydenburgh County Park is approximately seven miles away. Avalon Park & Preserve is a recreational enthusiast's paradise, providing miles of walking trails surrounded by the area's natural beauty. Fairfield at St. James is also located near the private town beaches in Nissequogue. Wine lovers will enjoy the Whisper Vineyards while golfers will have over a dozen courses just a short drive away. 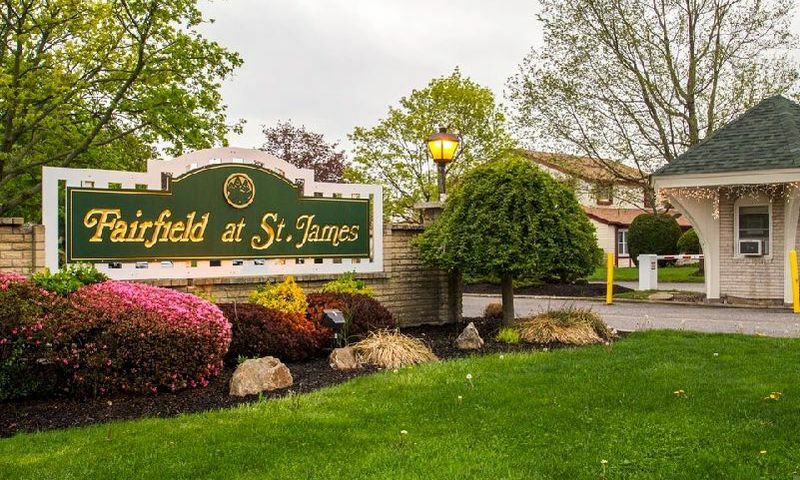 Fairfield at St. James is a terrific choice for an active adult community on Long Island, NY. There are plenty of activities available in Fairfield at St. James. Here is a sample of some of the clubs, activities and classes offered here. Fairfield at St. James is mostly comprised of condominium units that generally offer one or two bedrooms, one to two bathrooms, and a one-car garage or driveway. Most homes offer a private balcony or patio. Please Note: Floor plans are not available at this time. Fairfield at St. James has a select number of townhomes. These homes offer three bedrooms and two-and-a-half bathrooms. Some units have a garage while others have a driveway. Please Note: Floor plans are not available at this time. 55places.com is not affiliated with the developer(s) or homeowners association of Fairfield at St. James. The information you submit is distributed to a 55places.com Partner Agent, who is a licensed real estate agent. The information regarding Fairfield at St. James has not been verified or approved by the developer or homeowners association. Please verify all information prior to purchasing. 55places.com is not responsible for any errors regarding the information displayed on this website.